Hunt To Read: The Story Business: What's Next? I've made it far from secret that I think that most writers and publishers currently see the entire book business with varying shades of glasses, ranging from "rose-colored" to "absolute blindfold" in opacity. 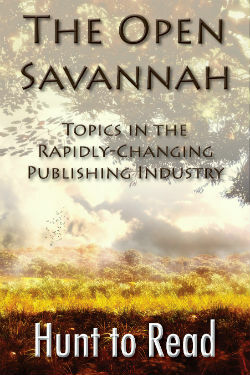 Everyone seems to know where publishing is headed, from New York publishers who feel that "any minute now" indie writers will "come to their senses" and sign a deal (any deal) with them, to the indie writers who think that publishers are all just bloodsucking leeches out to screw over every writer in their path. If there's one thing that I've learned during my two years in this business, it's that everything is constantly changing. What's true today might not be true tomorrow. The recent Kobo-W.H. Smith kerfuffle proved that--true, a lot of folks didn't seem to care because "hey, it's just Kobo, LOL!" But these are the same people who would storm Seattle if Amazon started pulling a bunch of books for "review," warranted or not. And Amazon could; absolutely, they could do the same thing. While Jeff Bezos seems to have a good head on his shoulders, I find it hard to believe that Kindle Direct Publishing takes more than five minutes of his time on any given day. Hundreds of other decision-makers (who, to be fair thus far, also seem to be well-intentioned) hold the fortunes of writers and publishers in their hands, yet never receive more than the same five minutes of thought collectively from the very cadre of writers and publishers who should be getting to know those folks, however possible. Things can change at a moment's notice in the book business, not to mention the story business as a whole, where technical innovations continue to push the limits of what we consider entertainment. There will always be people who like to curl up with a good book. Books also work well during commutes and long waits where people might not have their headphones. And yet, it sure seems like everyone's missing the larger picture here. We have wondrous new devices that are centuries ahead of anything that visionaries like Gene Roddenberry thought we'd have at this point in time, and yet we use them to consume the "same old" media that we've had for years and years: books, movies, games, etc. My question to you is, "What's next?" There has to be some kind of entertainment that busts through tablets and smart phones, easier to create than a movie, yet wondrously deep and enriching like a novel. Is it augmented books, where sounds and pictures creep across the screen as someone pages through the work? I don't think so--that sure seems like a bunch of pop-up ads that I would get tired of within about five minutes. So what's the next step then? Is it collaborative storytelling? Using stories as full-out memes to drive conversations? Maybe even more immersive technology, akin to Star Trek's holodeck, that will put us in incredibly detailed new worlds that we could barely dream of even a decade ago? Odds are that someone's thinking about this issue already, but probably not as many people as you might think. And even if you think your idea's crazy, that's probably what the rest of the folks in Florence thought about Da Vinci's sketches when he was still kicking around. Thoughts? Ideas? Leave them in the comments.